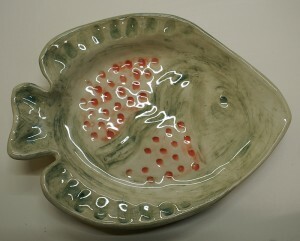 I’d unloaded my kiln in which there were a few bisque stamps among other items. I decided I wanted to test them out. 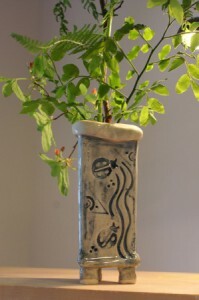 I quickly rolled out a few slabs of wet clay and happily tested each of my new stamps. Success, they worked fine! Oh! It wants to be a goddess! I surrendered. 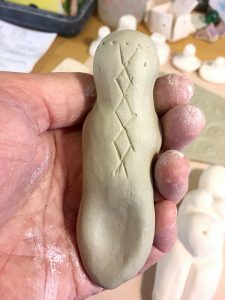 I began to form the clay into the goddess shape that comes to me again and again. 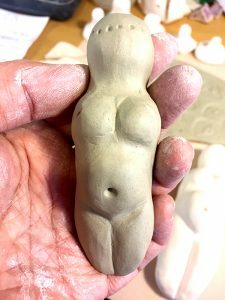 These forms are based roughly on an ancient goddess, the Venus of Willendorf. As she begins to take shape, she tells me she’d like a crown and a braid, please. Of course. And so she is given a crown and a braid, of sorts, they are pressed into the clay to suggest that they are there. She seems content with that. She tells me about her purpose of healing and helping someone to connect with their own inner divinity. Or is that only my imagination hoping to energetically infuse the best intentions into her? Newly formed goddess with bisque goddesses. 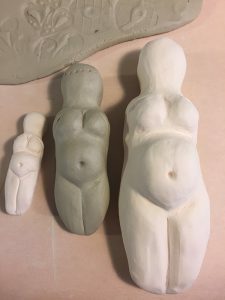 As I complete her form, I place her between two of her goddess sisters, freshly out of the bisque firing. They are not yet colored and glazed, just farther along in the creation process. I find it fascinating how each one of these seems to have her own story, personality and even shape. Just like how people do. Same but different. A few weeks later she is glazed along with a handful of other goddesses. I am at a holiday artisan’s market and decide to put out four of my completed goddesses. 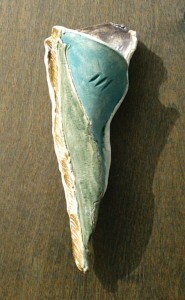 Before I do, I hold each sculpture in my hand, get very quiet and listen. 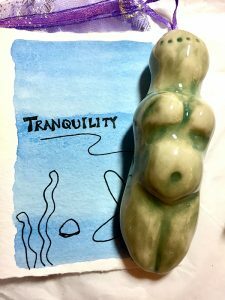 This one, I “hear” the word “tranquility.” I add her word to a watercolored display card which will accompany her when she goes to her right owner. Although some of this may sound a bit kooky, I trust my intuition and inner knowings. And, my “hearing” in that regard is getting better and better as I practice listening to the whispers of my muses, guides, or angels. What whispers have you tuned in to lately? 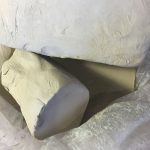 This entry was posted in Art business, Being an artist, Pottery studio, Spiritual musings and tagged artist, Business of art, clay, goddess, personal reflection, potter, pottery, studio on December 18, 2017 by Tammy.